No trip is complete without shopping at a particular place. Jabalpur has a lot to offer when it comes to shopping. Try buying the items mentioned below as a remembrance of this wonderful trip at Jabalpur. Jabalpur in Madhya Pradesh enjoys a sub-tropical climate. The place is usually very hot in summers with May one of the hottest month of the year. Summers last from March up to June. One should definitely avoid visiting during summers. Summers are totally unbearable. Monsoon on the other hand is normal, which last towards October. But the best season is winters, which usually start from November and last up to early March. Hence the best time to visit this city is during winter. But the climate is also pleasant during post monsoons. The area blossoms up with rains and offers picturesque view. Since this place is located amidst picturesque settings with several low rocky barren hillocks and Narmada River flowing within it. The monsoons add it up to the beauty. So the ideal time to visit this city is from October to March, when the climate is pretty favorable and enjoyable. This city can offer a great shopping experience as there is much more to buy if one is planning to. 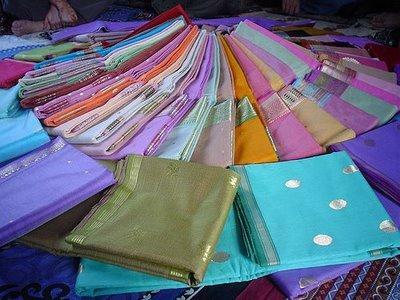 The local and old bazaars are known for few of the ethnic and authentic Jabalpur articles which include the famous terracotta items, Mahaeshwari Saree and Chanderi Sarees. Also toys and various other artifacts of this city are famous too. There are many malls and shopping market present in the city for a complete shopping experience. The Old Bazaar is famous and popular for various sale of authentic and traditional items. Various lanes and chowks have numerous stalls that sell exquisite items. The government museum, Mrignayani is an excellent option for buying handicrafts. Things to buy: Maheshwari Saree, Chanderi Saree, Terracotta artifacts, toys, ornaments, god idols, silverware, brass items, jute crafts, handicrafts. Madan Mahal Fort: Madan Mahal Fort is one of the most enchanting forts in Madhya Pradesh belonging to the Gond Dynasty. Madan Mahal Fort is located in the city and was built by Raja Madan Singh in 11th Century. Madan Mahal Fort is located on a small hillock, exactly 500 meters above the ground. Madan Mahal Fort has witnessed and passed famous turbulent times in the history. Madan Mahal Fort was actually considered to be a watch tower, during the reigns of Rani Durgavati. The architectural design of this fort is worth watching and the fort still manages to stand tall and offers an breathtaking view of the city below. 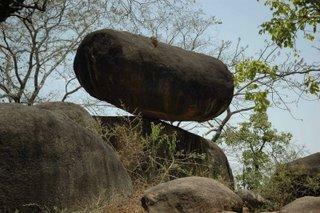 One can also visit the Balancing Rock located just near the Madan Mahal Fort. Rani Durgavati Museum: Rani Durgavati is one of the notable historical figures in India. The Rani Durgavati Museum is a memoir constructed in her name. This city holds a museum in her name which is located near the Tempo Stand. The Rani Durgavati Museum is a must visit point in the city as it houses several ancient and precious artifacts. These artifacts are very enriching as they speak about our ancient heritage, relics and various ancient letters. Few of the collection other than the artifacts include a special collection of photos of Mahatma Gandhi. The must see artifact at Rani Durgavati is the red sandstone replica of Lord Shiva and Devi Parvati. This artifact is from the 10th Century and is worth watching. Then there are various other notable idols of Goddess Durga, Yogini Devi from Chausath Yogini Temple and much more. Marble Rocks: Marble Rocks are located around 25 km from the city at Bhedaghat. Marble Rocks are located on the banks of River Narmada and famous for its wide and tall marble rocks that rise to more than 100 feet high on both the sides of the river. When visited during day, the Marble Rocks sparkle like glitter casting shadows on the waters. But during night, the beauty of these Marble Rocks is beyond words and successfully manages to please the tourists. Boating is one of the activities that is carried out at Marble Rocks. Chausath Yogini Temple: The Chausat Yogini Temple forms one of the religious places to visit. The temple is located on a hill top and has many stairs to climb. But the view from the top of the temple is breath-taking and worth watching. The temple of Chausath Yogini was built during the Kalchuri Dynasty somewhere in the 10th century. The temple houses goddess Durga and the architecture of this temple is amazing with various artistic carvings and stone idols intricately placed all over the temple. These beautiful carvings form one of the main reasons for visiting this temple. Dhuandhar Waterfall: Dhuandhar Waterfalls is one of the famous attractions in Bhedaghat near the city. These waterfalls are pretty rough and yet breathtaking. The Dhuandhar waterfalls form after the passing of Marble Rocks. The water from the Marble Rocks end up forming a smoking waterfall. The waterfall is named so, Dhuandhar for the word, Dhuan which means Smoke in Hindi. 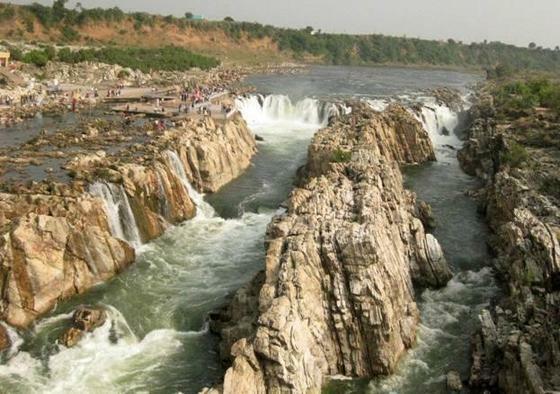 This waterfall is located on the Narmada River around 25 km from the city. One visiting Marble Rocks can visit this place too. Bandhavgarh National Park: Bandhavagarh National Park is one of the most popular national parks in India. The park is located around 190 km from the city. Bandhavgarh National Park is known for its amazing and endangered wildlife residents including the tiger, nilgais, endangered birds and many more. Once in Bandhavgarh, tourist also has the option of visiting various other tourist attractions nearby Bandhavgarh National Park which includes Bandhavgarh Fort, Bandhavgarh Hill and many more. Pench National Park: Pench National Park is one of the famous national parks in Madhya Pradesh. Pench National Park is an established tiger reserve known for its tiger population. Other than tigers, one gets to see various other wide range of flora and fauna which includes wild boar, jackal, striped hyena, Indian wild dogs and many other endangered species. Tourists get to enjoy watching these predators by means of jungle safari. Also go through Tips to Remember while Visiting Pench National Park. 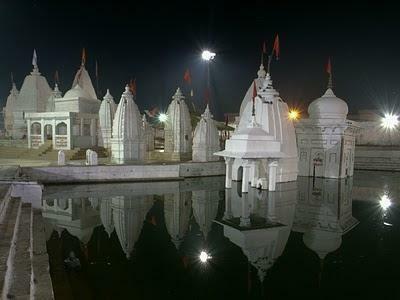 Amarkantak: Amarkantak is a sacred place located 218 km from the city. Amarkantak forms a place of religious importance among tourists as River Narmada is said to have started from this point. Yet to be explored, Amarkantak has much to show and offer its tourists, which include the Narmadakund, various temples, beautiful groves, wonderful waterfalls and various other fine pieces of natural beauty. Other than the above mentioned tourist places, one can also visit the Tripuri Jain Temple, Shaheed Smarak, Tilwara Ghat, Khandaari Jalashay Water Works which is a small dam and beautiful reserve located in this place. 1. To get around the city, it's advisable to travel in the mini buses, or auto-rickshaws. That makes traveling much cheaper. Even the local cycle rickshaws are pretty helpful in such cases. 2. Don't miss visiting Tilwara Ghat Point as that's the place from where Mahatma Gandhi's ashes were immersed in River Narmada. 3. If you enjoy trekking, don't miss the opportunity of trekking up to Chausath Yogini Temple. It offers an excellent trek. 4. Bargaining is a must in the Old Bazaar, as the vendors may charge exorbitant prices for articles which may actually cost no more than half of its mentioned cost. 5. If you are in mood of eating some roadside food, try out the street vendors near the Fuhara. This area is known for its tasty snacks and desserts. 6. Other than shopping in the mega malls and city malls, try and visit the gallis or lanes of the Bazaar for authentic and traditional buy. 7. This city offers excellent boat cruising options for tourists. So don't miss your ride. 8. Make it a point to visit Marble Rocks during Full moon night, it's very glittery and beautiful. 9. Avoid visiting the city during April and May, the climate is unbearable due to the scorching heat. 10. This place forms a complete tour package with everything right from mountains to valleys, forts to forest and monuments to museum..everything within one city.